I sure do love craigslist. 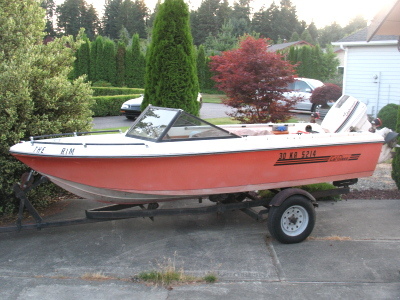 I've been looking for a boat for a while, and after nearly giving up on trying to find a good deal during the summer (when boats should be at their highest price, due to demand), my wife sent me a link to an ad for a boat for $800. That same day, we drove over to take a look at it. As it turns out, the boat was in relatively good shape, although it has been sitting for a number of years. 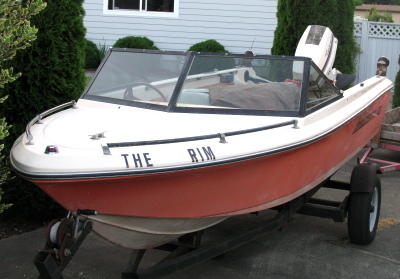 The name of the boat is "The Rim," as it states on the side of the boat. However, a long-time-ago previous owner (the boat is about 30 years old) originally named it "The Shrimp," which I think is a much more clever name. A more recent owner scrubbed off the SH and the P and had it officially renamed to "The Rim." I plan to change it back. Anyhow, I offered $750 for it, and a deal was made. I now own my first boat. Hooray! Congratulations. That was a great deal. Boat, trailer and engine. Inspect the trailer carefully. Make sure you remove the wheels and grease the wheel bearings. They are usually neglected by owners. Yeah - I'm a little concerned about the trailer as well. It actually looks like it's in decent shape, but I'll certainly grease up the bearings. I have no clue if the engine holds any compression at the moment. It sat for a few years, so I might take a bit of an overhaul. I'm sure I could get it to fire up, though. I'm pretty handy with engines. I declare The Rim and Shrimp both substandard names. The only appropriate name is Clarissa. Clarissa? What? What are you referencing? Congrats on the boat! I hope that engine isn't too much trouble to get running. Let me know if you need any help with it or the trailer, etc..
Hey Ed! Good to hear from you. I'd love to get whatever advice I can get from you on this boat. I've joined the iBoats forum and am trying to glean as much as information as I can from there, but if you ever want to stop by and poke around, I'd glad to hang out over a beer and see what we can do.